Tether has announced that it has severed its relationship with Friedman, LLP. Friedman was the auditing firm gracious enough to verify the transparency Tether likes to brag about. You might be asking yourself, what the hell is a tether? Here’s the view from 30,000 feet and a brief history of milestone events from 2017. Tether.to as a concept is wonderful. There are loads of crypto exchanges but many can’t or won’t handle your fiat currency. Dealing with banking regulations to provide on and off ramps for fiat currencies is a major headache so Tether, the brainchild of crypto exchange bitfinex, came to the rescue. Tether will convert your greenbacks in to an altcoin known as USDT. Tether takes its fee and holds on to the remaining US dollars (and some euros) to provide holders of USDT a frictionless path back to their fiat currency. To keep everything on the up and up Tether even has a publicly visible blockchain just like bitcoin; by blockchain magic the Tether chain is actually stored on the bitcoin chain. In around April of 2017 Tether/Bitfinex began a quick (and ultimately withdrawn) legal dispute with Wells Fargo after Wells would no longer act as the correspondent for Tether’s Taiwanese bank. Tether sued ostensibly for breach of contract but ultimately withdrew the complaint and moved on. At this point there’s roughly $60 million tethers outstanding. In late September 2017 Friedman LLP publishes an audit report on behalf of Tether. This audit did include reconciliation between the tethers recorded on the block chain, the tethers issued on the transparency page of the tether website and bank account statements. This audit did not include ancillary steps such as reviewing banking agreements to ensure that tether actually has access to transfer any of the funds or if the balance in an account was committed to a use other than redemption of tethers. At the point of this audit the numbers matched up and there were about $460 million of tethers outstanding. 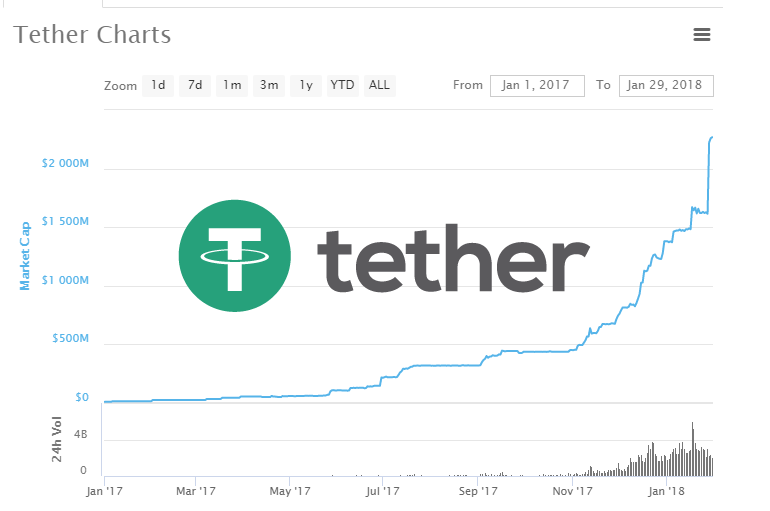 In around November 2017 tether suffered an attack resulting in the loss of about $30 million tethers and since then withdrawals have been suspended. Who would deposit money with an organization that won’t let you withdraw? No matter, the tethers now stand at about $600 million. But, what about when you’re no longer allowing new accounts? Tether and Bitfinex have suspended new account signups since the middle of December 2017. No big deal again, at this point there are just over $1 billion tethers outstanding. As of today tether has suffered at least one banking dispute which locked about $180 million of customer funds (including both Bitfinex and Tether funds), lost $30 million of customer funds, suspended withdrawals, suspended new accounts and there are about $2.25 billion tethers outstanding; the cherry on top is now the auditors have washed their hands. Disclaimer: I’m still long bitcoin, ethereum, bitcoin cash, ripple and neo.